A few weeks ago, I wanted to use one of the vintage IBM 1401 mainframe computers at the Computer History Museum, but the computer wasn't working.1 This article describes the multi-week repair process to get the computer working again. The problem started when the machine was powered up at the same time someone shut down the main power, apparently causing some sort of destructive power transient. The computer's core memory completely stopped working, making the computer unusable. To fix this we had to delve into the depths of the computer's core memory circuitry and the power supplies. 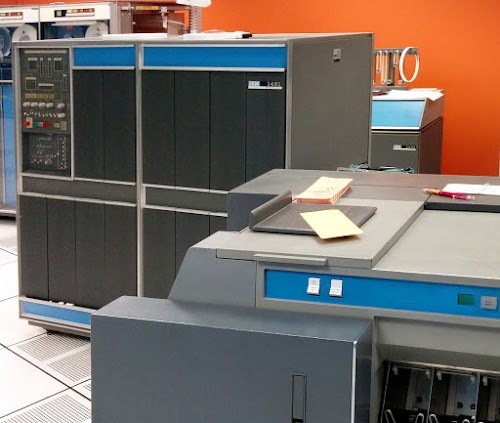 The IBM 1401 computer. The card reader/punch is in the foreground. The 12K memory expansion box is partially visible to the right behind the 1401. 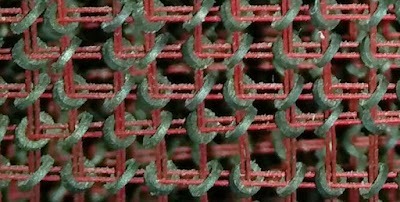 Detail of the core memory in the IBM 1401. 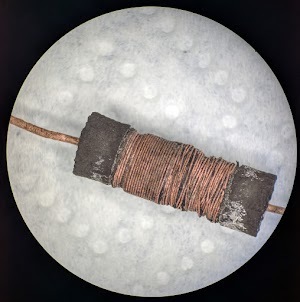 Each toroidal ferrite core stores one bit. 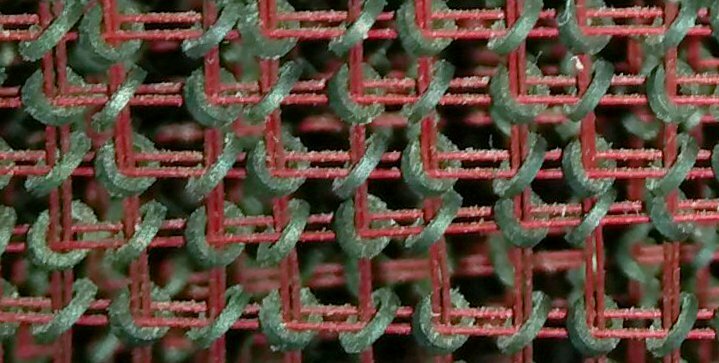 In the 1401, there are 4000 cores in each grid, forming a core plane that stores 4000 bits. Planes are then stacked up, one for each bit in the word, to form the complete core module, as shown below. 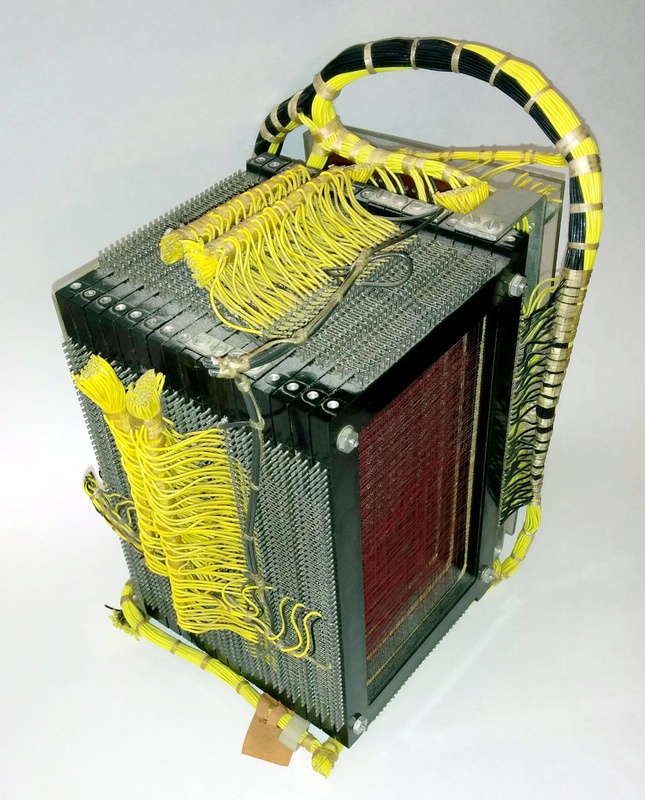 The 4000 character core memory module from an IBM 1401 computer. Tiny ferrite cores are strung on the red wires. To diagnose the memory problem, the team started probing the 1401 with an oscilloscope. They checked the signals that select the core module, the memory control signals, the incoming addresses, the clock signals and so forth, but everything looked okay. The next step was to see if the X and Y select signals were being generated properly. 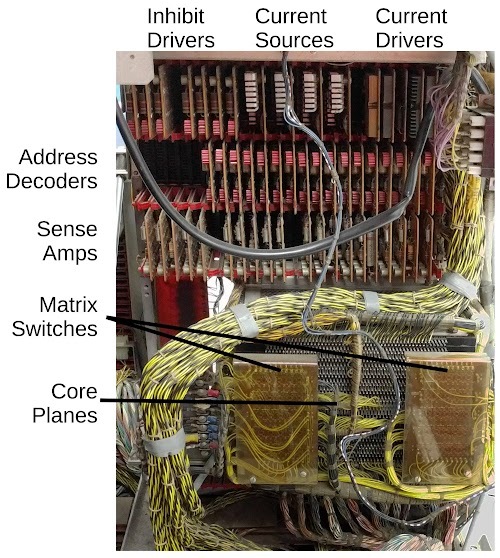 These pulses are generated by two boards called "matrix switches", one for the X pulse and one for the Y pulse.5 Some address lines are decoded and fed into the X matrix switch, while the other address lines are decoded and fed into the Y matrix switch. The matrix switches then create pulses on the appropriate X and Y select lines to access the desired address in the core planes. The photo below shows the core memory module and its supporting circuitry inside the 1401. The core memory module itself is at the bottom, with the two matrix switch boards mounted on it. Above it, three rows of circuit boards (each the size of a playing card) provide the electronics. The top row consists of inhibit drivers (used for writing memory) and the current source and current driver boards (providing current to the matrix switches). The middle row has 17 boards to decode the memory addresses. At the bottom 19 sense amplifier boards read the data signals from the cores. As you can see, core memory requires a lot of supporting electronics and wiring. Also note the heat sinks on most of these boards due to the high currents required by core memory. Inside the IBM 1401 computer, showing the key components of the core memory system. After some oscilloscope measurements, we found that one of the matrix switches wasn't generating pulses, which explained why the memory wasn't working. 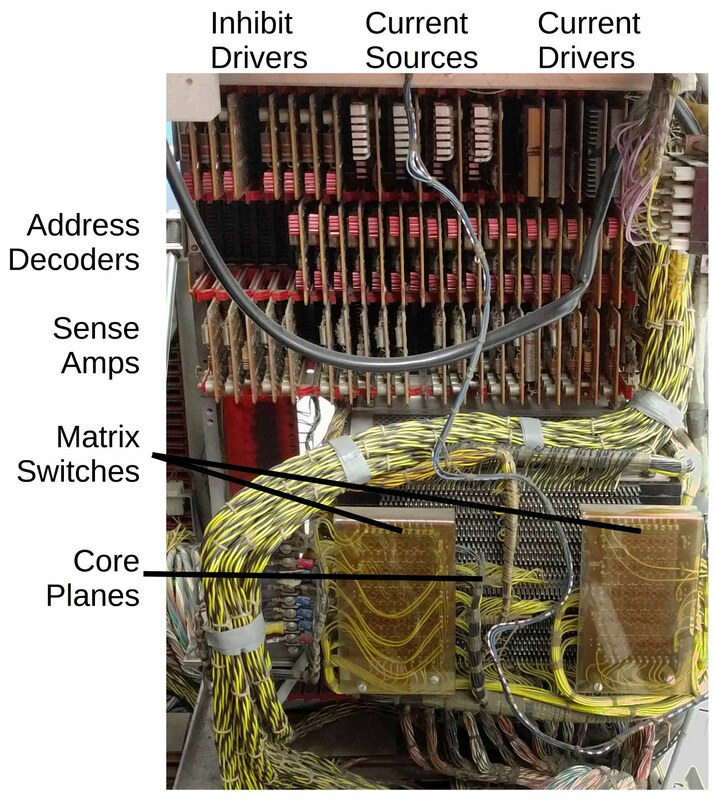 We started checking the signals going into the matrix switch and found one matrix switch input line showed some ringing, apparently enough to keep the matrix switch from functioning. Since the CHM has two 1401 computers, we decided to swap cards with the good machine to track down the fault. First we tried swapping the thermal switch board (below). One problem with core memory is that the properties of ferrite cores change with temperature. Some computers avoid this problem by heating the core memory to a constant temperature in air (as in the IBM 1620 computer) or an oil bath (as in the IBM 7090). The 1401 on the other hand uses temperature-controlled switches to adjust the current based on the ambient temperature. We swapped the "AKB" thermal switch board (below) and the associated "AKC" resistor board, with no effect. The core memory uses a thermal switch board to adjust the current through core memory as temperature changes. The switches open at 35°C, 29°C and 22°C. The type of the board (AKB) is stamped into the lower left of the board. Next we tried swapping the "AQW" current source boards that control current through the matrix switches.6 We swapped these board and the 1401's memory started working. Replacing the original boards one at a time, we found the bad board, shown below. The IBM 1401 has four "AQW" cards that generate currents for the core memory switches. This card had a faulty inductor (the upper green cylinder), preventing core memory from working. I examined the bad board and tested its components with an multimeter. There were two 1.2mH inductors on the board (the large green cylinders). I measured 3 ohms across one and 3 megaohms across the other, indicating that the second inductor had failed. With an open inductor, the board would only provide half the current. This explained why the matrix switch wasn't generating pulses, and thus why the core memory didn't work. 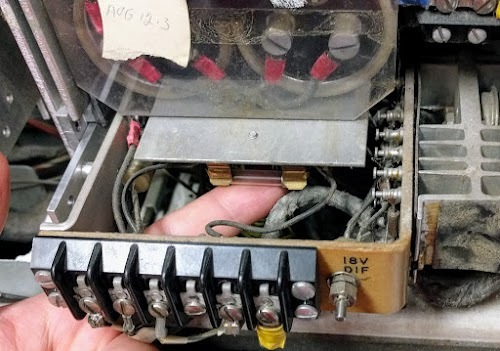 The faulty inductor from the IBM 1401 showing the failed connection. The replacement AQW card had one transistor instead of two, but was supposedly compatible with the old board. Despite misgivings from some team members, the bad AQW card was replaced with a one-transistor AQW card and we attempted to power the system back up. Relays clicked and fans spun, but the computer refused to power up. We put the old card back (after replacing the inductor), and the computer still wouldn't start. So now we had a bigger problem. Apparently something had gone wrong with the computer's power supplies so the debugging effort switched focus. 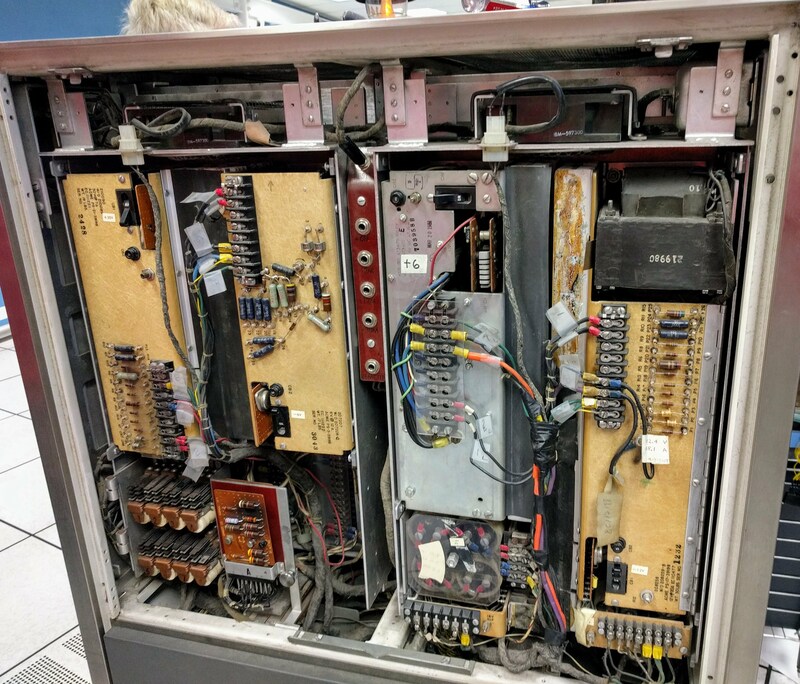 The power supply system for the IBM 1401 is more complex than you might expect. Curiously, the main power supplies for the system are inside the card reader; a 1250W ferro-resonant transformer in the card reader regulates the line input AC to 130V AC, which is fed to the 1401 computer itself through a thick cable under the floor. Smaller power supplies inside the 1401 then produce the necessary voltages. Power supplies in the IBM 1401. After measuring voltages on the multiple power supplies, the team concluded that the -6V power supply wasn't working right. This was a bit puzzling because the AQW card (the one we replaced) only uses +12 and +30 volts. Since it doesn't use -6 volts at all, I didn't see how it could mess up the -6 volt supply. Inside the IBM 1401's -6V power supply. The team removed the -6V supply and took it to the lab. In the photo above, you can see the heavy AC transformer and large electrolytic capacitors inside the power supply. Measuring the output transistors, they found one bad transistor and some weak transistors and decided to replace all six transistors. In the photo below, you can see the new transistors, mounted on the power supply's large heat sink. 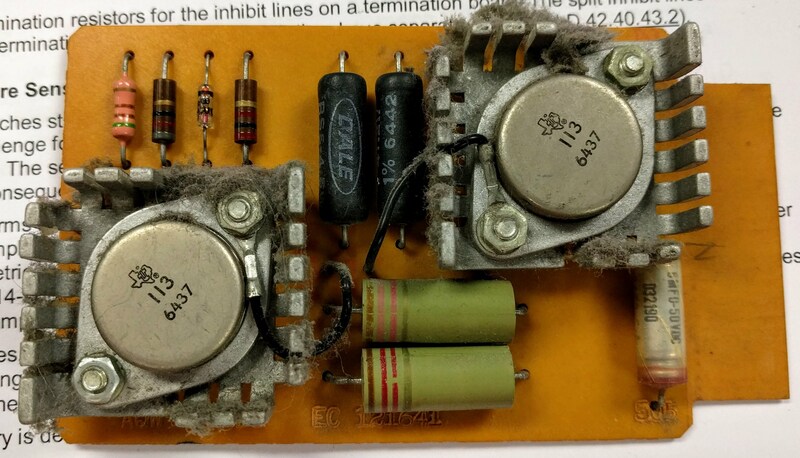 These are germanium power transistors; the whole computer is pre-silicon. The -6V power supply from the IBM 1401 uses six power transistors on a large heat sink. The -6V power supply tested okay in the lab with the new transistors, so it was installed back in the 1401. We hit the "Power On" button on the console and... it still didn't work. We still weren't getting -6V and the computer wouldn't power up. In the next repair session, we tried to determine why the computer wasn't powering up. Recall the eight relays mentioned earlier; these relays provide AC power to the power supplies in sequence to ensure that the supplies start up in the right order. If there is a problem with a voltage, the next relay in the sequence won't close and the power-up process will be blocked. We looked at which relays were closing and which weren't, and measured the voltages from the various power supplies. Eventually we determined that about halfway through the power-up process, relay #1 was not closing when it should, stopping the power-up sequence. Could the power problem be as simple as a burnt-out fuse? We opened up the 18V differential supply, and sure enough, there was a fuse and it was burnt out. After replacing the fuse, the system powered up fine and we were back in business. The 18V differential power supply in the IBM 1401 provides 12 volts to the core memory. The fuse is under the large electrolytic filter capacitors. A punch card with "Merry Xmas" and a tree punched into it. After all this debugging, what was the root cause of the problems? 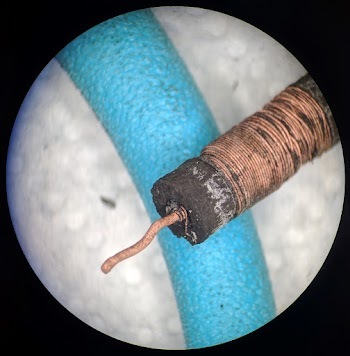 As far as we can tell, the original problem was the inductor failure and it's just a coincidence that the problem occurred after the power loss during system startup. 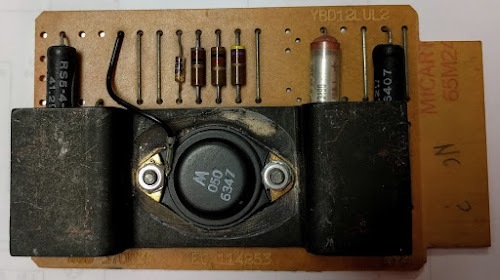 The new AQW card must have caused the fuse to blow, although we don't have a smoking gun.13 The reason the -6V power supply wasn't showing any voltage is because it was sequenced by relay #1, which didn't close because of the fuse. 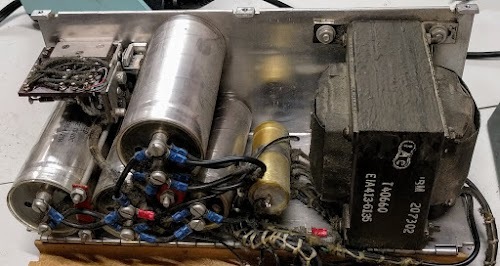 The bad transistors in the -6V power supply problem were apparently a pre-existing and non-critical problem; the good transistors handled enough load to keep the power supply working. The moral from all this is that keeping an old computer running is challenging and takes a talented team. Thanks to Robert Baruch for the inductor photos. Thanks to Carl Claunch for providing analysis. The Computer History Museum in Mountain View runs demonstrations of the IBM 1401 on Wednesdays and Saturdays so check it out if you're in the area; the demo schedule is here. Follow me on Twitter or RSS to find out about my latest blog posts. Strangely, half the inductor is nicely wound while the winding in the other half is kind of a mess. The faulty inductor from the IBM 1401. Front of my "Merry Xmas" punch card. Wow, brings back memories from an era bygone.. CDC CYBERs, DEC PDPs and VAX systems. My first computer, I programmed it in Autocoder. Thank you. This is a beautiful peek into the early days. Reading about an updated schematic with a penciled in fuse is a nice present on this Christmas morning. It's a shame you found the blown fuse last, might that have saved some trouble? Probably not. But swapping known good cards into a known bad system? You are far more daring than I am. This was almost my first computer, I worked decommissioning a 1401, porting Courseware programs into DEC Basic. I remember that my dad used to have an old power supply in a box in the garage when I grew up, and he newer ever used it. IIRC it were supposed to supply about 12V DC but it were made for a mains voltage of around 100-120V (or thereabout) while we in Europe had (and have) 220-240V, and that's probably why it were never used. That supply looked extremely similar to those of the IBM 1401. I remember the hinges for opening it, the yellow-ish insulating material that components and other stuff were mounted on, the configuration with four identical-sized capacitors, an US style circuit breaker, and I think I have a faint memory of the transistors being round instead of the later more common TO-3 package. However I don't think it was identical to any of the pictured power supplies, but my memory might be incorrect. Sadly I took it apart when I were old enough to know that I could argue that my dad would never ever use it as it has never been used for many years. It would had been nice to have it today as an artefact. The thing is that my parents had a radio/tv/home electronics shop and a by-then sturdy 12V power supply would had come in handy for demonstrating car stereos in the shop. Even more silly is that my grandparents (although on my mothers side) used to have an old vacuum cleaner that were supposed to run on 127V AC and it had a separate transformer (I've read documents stating that the mains voltage were switched from 127V to 220V sometime in the late 1940's at the place my grand parents used to live at then). So the transformer that once were used for that vacuum cleaner could probably had been used with this 12V power supply, bu noone thought about that at the time. Multnomah County (Portland, Oregon) school district had an IBM 1401 that the high schools could submit punched cards to, and receive line-printer output. Circa 1969-1972 or so. Each school got a key punch machine to go with the teletype connected to the HP 2000 Time Share Basic computer in the Math department. We got to see the computers on a field trip to the county building. I was more impressed with the HP computers than the IBM. The 1401 was strictly batch. Basically, the 1401 was to introduce us to Fortran programming, but in 1971 a Fortran simulator was written in Basic, and the keypunch was removed to the Business class, to teach keypunch skills. I am in the midst of making a card reader using an arduino and some homemade parts and pieces. My Uncle who died about ten years ago left me an Argosy Airstream trailer, in it was some core memory from a univac computer and some punch cards from an old ibm computer. Amongst a few other odd and ends as well. I really enjoyed reading your article. My Uncle used to work on these computers and would have loved reading this. I keep his parts in a shadow box o nthe wall and am using some of the NOS punch cards for my build. I am going to have to punch it by hand though. Thanks for all the hard work. I love seeing this old stuff being saved. Thanks everyone for the interesting comments. Mike: I could have used multi-punch, but where's the challenge in that? Also, keypunches don't like duplicating cards with weird hole patterns and it can actually damage them (the mechanism to move the code plate for printing gets pushed in bad directions). SimonElse: let me know if you need some cards punched for your project. I was reading a report from 1972 that said the radar digitizer was causing RF interference to the long haul radio, when its doors were opened. Technicians were sent out to analyze the problem. Yep, when the doors were opened, the radio link suffered. Closer inspection found that the component causing the interference was the core memory of the digitizer. You narrative brought back memories from Madras 1974! I worked for IBM then, and went to fix a problem on a 1401 at a customer location - Rats had gotten into the area above the memory stack and done their bit! Anyhow, I ended up un-soldering an entire core plane from the middle of the stack and replacing it with another one I had to un-solder from a spare (which had other bad frames, then replacing it and soldering all the connections. It worked, the customer and my field manager could not believe it! Hope to drop by sometime at the museum when I come by Silicon Valley and flip through the ILD's and ALDs's if possible. A friend and co-worker, Wayne Linder, came to help me troubleshoot an intermittent problem on a 1401 in the DC area many years ago. Wayne asked me to tap the back of the Tape control gate while he traced a circuit with a Tectronix Scope. I forgot that I still had my wedding band on and proceeded to short out something. It took us about 4 hours to fix that problem so that we could get back to the original bug. Ike Cabase. HaHa! That reminds me of the time when someone accidentally dropped a coin on the SMS card gate in a 7330 - As luck would have it, it happened to come to rest on the one card that happened to have the insulating coating on the land pattern on it - whew! ... and I know about the problems with the early TAU-9 tape control SMS cards -- It was 1967 or 1968 ?, my first 1401 account, and almost daily I had to troubleshoot intermittents. Invariably it was due to corrosion of the sharply bent through-hole leads of the 101 series transistors. 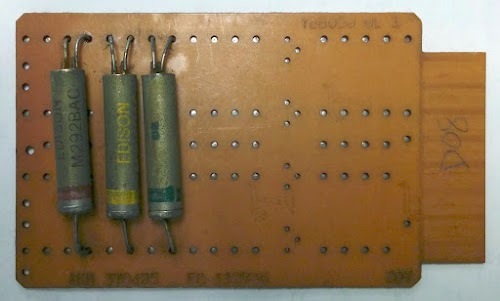 The SMS card land patterns were originally designed for larger transistors and had greater lead spacings, and the 101's were smaller, so when these were mounted on the cards, the leads had to be formed into a shape that would allow proper mounting and soldering. This caused minute cracks in the nickel(?) plating on the lead wires where they were bent. Over time, (and possible storage under humid conditions) rust would form and weaken the leads to the point where they would crack with normal vibration. If you were lucky, this could be seen in the 'scope signals if knew where to look but most often, we would have to whack the logic gates with a handfull of 5081 punched cards to provide not-so-gentle encouragement to induce failure! Really brought back my old memories of our work horse 1401. Starting from mid 60s till almost early 80s (yes early 80s) 1401s were the most popular used computers in India. Worked a lot on these machines during that time. !8 Volt differential power supply was adjusted to optimize the memory operation and the fuse was notorious for the powering up problems since there was no physical indication. All other power supplies had CBs which could be easily observed. Yes, bm! Do you recall "schmoo-ing" -- the process of optimizing the PS voltages to ensure that the average core would be magnetically biased correctly within the hysteresis curve. And it was so temperature dependent! ccdman (RK) You really helped me to recollect the expression "schmooing" which we used at that time. Your narration of incidence of rats reminded me of one of our installations where 1401 was located right above the canteen of that institute. It was practically annual affair to have rat droppings giving us intermittent 'process errors'. Once they also happened to invade 1311 disks which took almost 10hrs to diagnose the problem. Hello, I started to work at IBM (in Brazil) in 1974 and was immediately involved with the end of IBM /360 systems and starting with IBM /370 systems, as 3125, 3145, 3148 and such. I made all the basic training of the I/Os (card readers and punch units, printers 1403, tape drives - 2420 and 3420, Hard Disks 2319 and 3330). It was a fantastic adventure through a technology that for such time was way advanced, over what I knew of electronics - vacuum tubes and first transistors and starting the TTL 7400 family of IC's from Texas Instruments. Yes, it was a fascinating diving into a technology that only huge corporations as IBM had at that time. Traveled the world to make training for those machines at IBM plans. I was specially mind driven by the idea of making a whole 3145 processor training in 2 months, not only learning how to debug everything (and I mean "everything), but also microcode loaded from a 8" floppy disk. Several problems on the processor hardware would be located analyzing the microcode failure, when it fails and why it fails. I really exploded my mind in knowledge at those years. It gaves me great advantage above other people in my long future ahead, since I learn how to do things in the right way, technically speaking. My future in electronics (until today) is profoundly based on IBM quality and sound thinking, do it well, do it good, do it better than perfect. IBM was gifted by stating all their ideals and future objectives with one simple word, "THINK".